The significance and survival of Tent City University project is of interest to anyone thinking about what a university is and what role it plays in society. It also reveals how protest and activism are not just transitory moments but create new learning opportunities that can live on into the future lives of those involved. 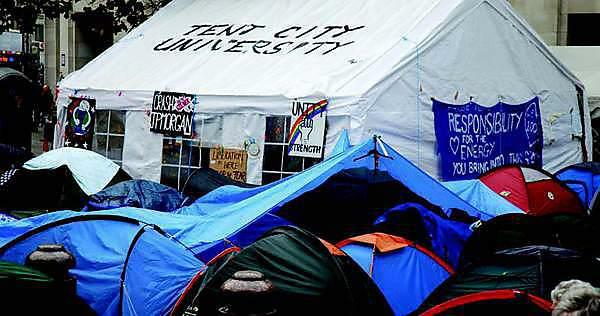 Tent City University was set up by the Occupy protest movement at its camp at St Paul’s Cathedral, London. Well-known academics came and gave talks and, more importantly, members of the Occupy community also developed informal seminars and workshops. This research project uses a life history method of multiple interviews to explore with participants from Tent City University what their experiences were like, how it differed from other forms of education across their life and how Tent City University continues to live on in their lives in multiple ways. It interviews them several times using photographs and artefacts to evoke memories and reflections. It will create a map of the traces created by Tent City University across different spaces, countries and media. The project is timely because there is much debate about the future role of universities, what different forms they might take, how they engage productively with communities and how to protect intellectual freedom and equal access to knowledge. Thanks to pump priming from the IHC, Professor Jocey Quinn was awarded a grant from the British Academy to develop this project.